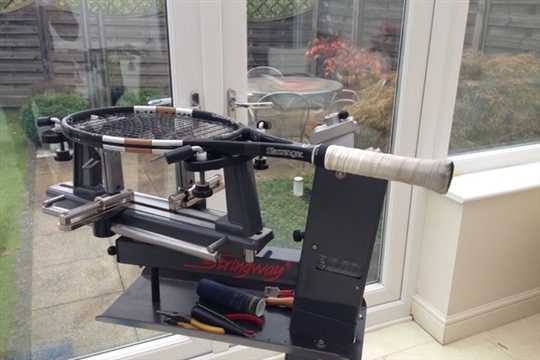 Vale Stringing aim to provide a fast and efficient racket stringing service. Rackets are strung using a constant pull professional quality machine. Constant pull stringing machine, providing a more accurate and consistent tension. Computer database on all customers for easy reference. An extensive range of string is available. Special orders available within 2 days. Refer A Friend to Vale Stringing and Earn £2.00 Off Your Next Racquet Service! More and more tour players are customizing their strings with hybrid combinations (i.e. different strings on the crosses and the mains) to increase their power, spin or control. Recently, at Wimbledon, more than 40% of players had customized hybrid strings. Strings that will last longer, may loose tension before breaking, not suitable for player who suffer from tennis elbow! Strings suited to performance players, wanting good feel and touch. High Quality strings that are easier on the arm. For players on a budget, or occasional players.